I'd like to tell you a bit about my PhD/dissertation project which started a few weeks ago. It deals with developing a method to exchange arbitrary messages with a lucid dreamer from the wake world. For this, I use lucid dreaming, dream incorporations (e.g. light flashes or acoustic stimuli), body signals (e.g. eye movements), and a message coding scheme (e.g. Morse code) to transfer arbitrary messages (and not only simple pre-defined signals like LRLR). There has been quite some research on this already, but to my knowledge not on both bi-directional (wake world->dream world->wake world) and arbitrary (not pre-defined) messages. In the end, I hope to make possible things like learning of new knowledge during sleep, controlling a machine from sleep (e.g. a quadrocopter) etc. I worked on this in my Master's thesis already, in which I transferred simple random math problems (e.g. "4+4" or "5-2") to the dream and let the dreamer answer them using eye movements + Morse code. This worked at least once, so I now try to improve its reliability and messaging "power". ... comment on this and share your own experiences+knowledge! One more thing: I am looking for skilled lucid dreamers to conduct sleep communication in our sleep laboratory at University Osnabrück, Germany. If you are from Europe (or even Germany) and want ot participate, please contact me! Sibyline, StephL, Mismagius and 5 others like this. Willkommen bei DreamViews! I had a look at your PhD project website. Elite. What type of sensors / hardware do you have access to in the lab? Help yourself to the software that I developed for this very purpose: hackaday.com/2012/06/20/communicating-from-inside-your-dreams. I can type just by blinking in Morse Code patterns. I might be passing through the Hochsauerland later this year, about two hours south of the university... but I doubt that I would be able to perform under laboratory conditions, I have not been able to reproduce it consistently enough to get a clean recording from the dream state. Hence all the hacking. Highlander, Maxis, KristofferA and 1 others like this. Thank you! 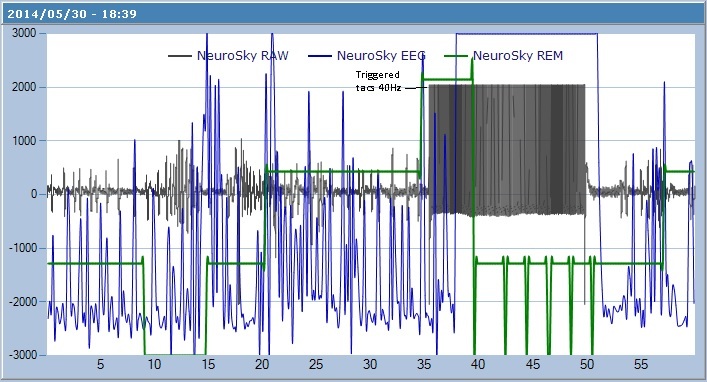 I currently record with a 10-20-system EEG, a horizontal and vertical EOG (eye movements) and an EMG (muscle tonus), plus a Zeo (1-channel EEG in which you can also see eye artifacts which are strong enough to detect patterns like morse codes from it). I might be using a data glove measuring even finest hand movements (don't know whether it works, have to try out) in future, but I am not sure. Apart from this dream world->wake world signaling, I mainly use visual signals and sounds + e.g. morse code for messaging wake world->dream world at the moment. A question: What do you mean with "accelerometer"? What kind of acceleration do you measure? Do you mean the acceleration of the eyes, the change of the electric field due to eye movements? You are welcome to visit our lab if you want, even if it is just for a chat, an exchange of ideas! Feel free to contact me! StephL and IAmCoder like this. I would use magnetic signaling or something else that reliably affects brainwave patterns in a certain way to communicate to and maybe a finger-morse code to communicate back. What i really want to see is a machine that changes brainwaves and that you can control from dreams. Do you know of the god helmet? Well, just saying you can easily train a person to recognize a state induced by the god-helmet. It is just a matter of doing the same while asleep. I would actually love to participate in the experiment, germany is so close, but i should work on actually sleeping enough beforehand, my record is not great. I use an accelerometer with a resolution of 3660µg and a measurement range of ±5g (49 m/s2). It is sensitive enough to pick up the heartbeat when you are still, and picks up movements around the eyes. But I also have an OpenEEG device that can measure the change of the electric field due to eye movements. I had started a plugin for the Zeo, but didn't get enough testing done because I don't have one. What language did you write your application in? Mine is in C# - I think I used the ZeoScope as a base. Can you run a quick test to see if the plugin works - I only have one screenshot of it working and I don't know how accurate is? As far as I know, there has been some TMS/tDCS research (~applying an electric current directly on the brain) combined with lucid dreaming last year or so, but the results were not very strong. I might conduct some reseach like this in future, too, but this is quite complex and of course you need special hardware for it. But it is definitely a nice idea. Well actually I already controlled a quadcopter using eye movements and muscle artifacts. If you have a sufficiently good auto-pilot which holds the quadcopter in position whilst there is no command given, you can just concentrate on giving commands like "start", "fly forward", "backward", "left", "right", "higher", "lower", "land", "turn left" and "turn right". Of course it is very simplistic, but hey, it is a start and might work. Ok so with your accelerometer you really measure the acceleration/movement of the skin due to heart beat underneath it then? Or do I misunderstand this? That sounds very interesting! And applied to the eyes: Can you also figure out the gaze direction through closed eyes, or "only" the movement itself? In which directions can you measure the movement? I am currently working on the third version of my software called Sleeator - it is fully written in Python. But this version will be extremely modular, so my plan is that any module (e.g. for eye movement detection, REM detection, stimulus generation, data visualization etc.) can be programmed in any language. It is then just started as a *.exe and then communicates with the other modules/the Sleeator using sockets. I am not very familiar with C#, I don't even think I have a compiler for it. But just send me the code or (if you have) an executable file, I will see what I can do! Always very, very happy when I come across such threads!! I haven't had a chance to fly a quadcopter, so I guess if it holds itself in position, then the lag wouldn't matter. Although it measures the acceleration in all directions - X, Y and Z; I don't believe I can figure out the gaze direction... only the intensity of the eye movements. The source for the live Morse Code translation from the second video is here: https://github.com/lucidcode/LucidSc...andler.cs#L552. You can download the Zeo plugin from the Lucid Scribe page - let me know how that goes. I am no computer whiz, but it is inspirational to see that there are some computer whizzes out there working on this aspect of lucid dreaming. After reading Ursula Voss's new publication about gamma stimulation and then seeing this, it really highlights the idea that before we can do any real investigations into the lucid dreaming brain, we have to be able to access it regularly (Voss) and hear directly from it (you guys). Thanks a ton for your work, and please keep it up! I am also curious, it looks like a lot of this work may be preliminary...am I wrong? Have either of you communicated successfully across states with these programs/devices? If so, to what extent? Sure. I was just writing code that monitors the live threads on this forum when this one bubbled to the top. Thanks for thanking - always nice to see the code talking back! Only the letter "S" for me so far, but it was indistinguishable from noise on the printout so I have to keep practicing!